I started all this back when Luke was 18 months old (he's almost 4 now). Yes, he was pretty old to begin cloth diapers, but we knew that we would have more children eventually. Luke used them from 18 months to 2 years (so about 6 months at night and on the weekends and holidays- daycare wouldn't touch them). After some quick calculations he used cloth diapers 558ish times in those 6 months. That's 558 diapers we didn't have to buy. I'll break the calculations down in another post. At 2 years old daycare insisted that we start potty training, so we did. He still wore diapers at night for the next year and a half. We half heartedly cloth diapered during this time- sometimes we used disposables, sometimes big boy underwear, and sometimes cloth diapers. So a third of a year is approximately 121 days. That's another 121 diapers we didn't have to buy. We originally bought 6 Bum Genius 4.0 diapers. They are one size pocket diapers meaning they grow with your baby from 7-35lbs+. Notice how these are snapped? This is like a "medium" size. Emberly is 16-17lbs and they fit her perfectly like this. Those snaps enable you to make the diapers bigger as your baby gets bigger. Here the left orange one is unsnapped and the right green one is still snapped. They can also get smaller if you snapped them to the lowest row. Goodbye grandma's cloth diapers! You no longer use diaper pins when cloth diapering (yikes!). They make diapers in snaps or aplix (which is velcro). I prefer the snaps, but I did end with one aplix because after ordering 5 I got 1 diaper free so I wasn't able to choose what I wanted (snaps or aplix) or color. They sent me aplix in white. The pocket part means there is a pocket built in where you stuff the inserts. 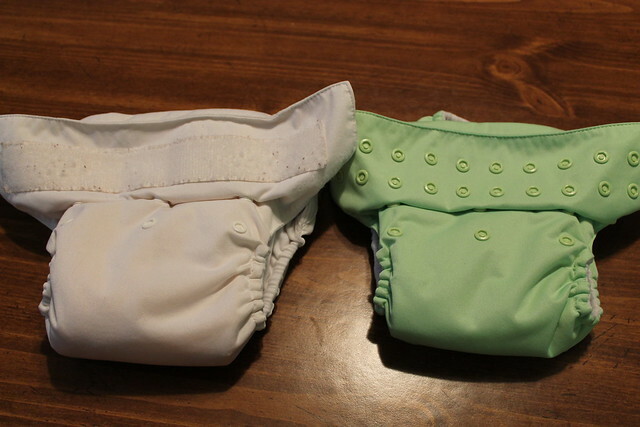 These are very similar to disposable diapers which is why they are so popular. You pretty much have 2 pieces- the diaper and the insert. The diaper outside (the colorful part) is PUL (Polyurethane laminate fabric) which is waterproof. There is an additional layer inside that makes up the "pocket". This is soft absorbent material. The insert, which is made of microfiber, is stuffed between the outside PUL and the inside absorbent layer. Pocket diapers can only be used once before they need to be washed (just like a regular diaper- that you would throw away). Size wise both my kids were over 7lbs at birth and there was no way they would have fit in the 4.0s that early. In our case they needed to get chunky thighs before the diapers would fit snug enough to not leak. On the other end Luke wore them until he was 40lbs. Sizing just depends on how your kids are built. Pros of pockets: They are alot like disposables. 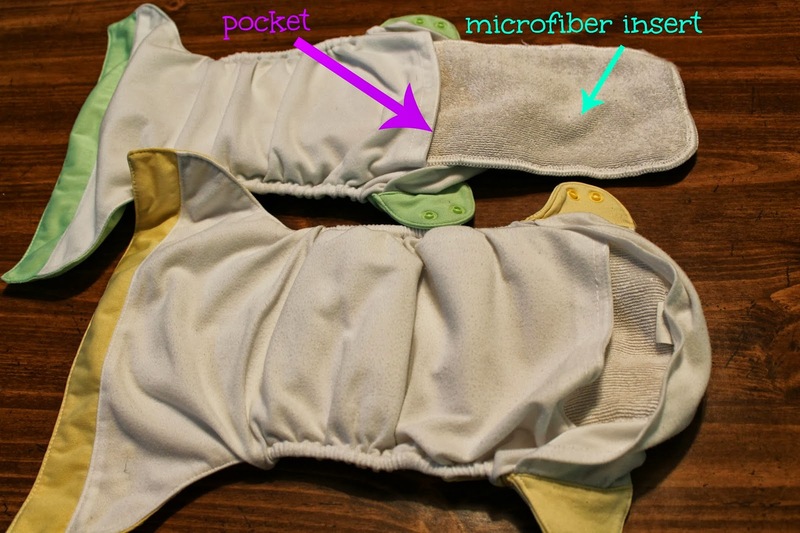 Also you can stuff more inserts in the pocket if your child is a heavy wetter (like an extra insert or a burp cloth). Cons of pockets: You have to un-stuff and re-stuff the diapers before and after each wash. I'll talk about washing in another post. This really isn't time consuming and you fall into a routine, but you do have to do it. Some people don't unstuff the diapers and claim that the inserts fall out in the wash. I've tried it a few times and it's about 50/50. I prefer to manually to unstuff so I ensure the insert gets totally cleaned. Obviously the Thirsties on the left are smaller because they fit for a shorter amount of time. I'm convinced that I got a more accurate fit when she was tiny with these. She has completely outgrown her Thirsties :( I almost cried. One day I sat her up and the snaps popped open. I figured it was time to pass them on. They are listed on ebay in hopes of them selling! but they are very different! Basically the outside shell is waterproof PUL, and you place a prefold (pretty much a super absorbant burp cloth) inside the shell. Here's what a prefold looks like next to the diaper. Because I have to snap the diaper a little smaller, I have to fold the prefold down in front. That's ok because she just has more absorbency there! The great thing with diaper covers is that they are cheaper than pocket diapers and they can be used more than once before washing as long as just pee is involved. If I'm changing her diaper and it's a prefold/cover I dump the prefold in our wet bag, wipe the cover with a wipe, and let it sit to dry. I'll put a different clean diaper on her for the time being. Once it's dry (at the next change) I put another prefold in and we're good to go until the next change. I do this approximately 3 times before I actually wash the cover (as long as it doesn't stink and there is no poop). Remember the cover doesn't actually touch the skin, just the prefold and the prefold is fresh at each change. Pros: They can be used more than once which='s savings. Cons: You have to stuff them, and they are harder to get a perfect fit. Also your prefolds have to fit in the cover of the diaper. Many prefolds come in different sizes for various absorbency. We loved Osocozy's better fit infant prefolds for the baby infant stage (up to about 14lbs) and Bumkins Premium (which is technically size large) for the stage we're in now (15-30lbs). Hands down pocket diapers are easier and much more like regular disposable diapers. Josh prefers pocket diapers over prefolds and covers. I don't care. I think the prefolds/covers are fun because I don't have to wash them at each change so one diaper can actually last 3 changes during the day. But I do love the ease of pockets. They also make AIO (All in Ones) that don't have pockets. I haven't tried these because they are pricey. They are diapers where all the absorbent layers are sewn together and you wash everything all together so there's no stuffing involved. All this stuffing talk is making me think about Thanksgiving, and turkey! I just bought 5 more diapers since I had to transition out of our Thirsties. We now have 8 BG 4.0s, 4 Flips, and 5 Swaddle Bees and Blueberry pockets. These last us about 2 days which means I'm washing diapers every other day to make sure that we have enough to finish that second day. It sounds like alot, but I enjoy staying on top of it. If you have more than one kid in cloth you would obviously need more. 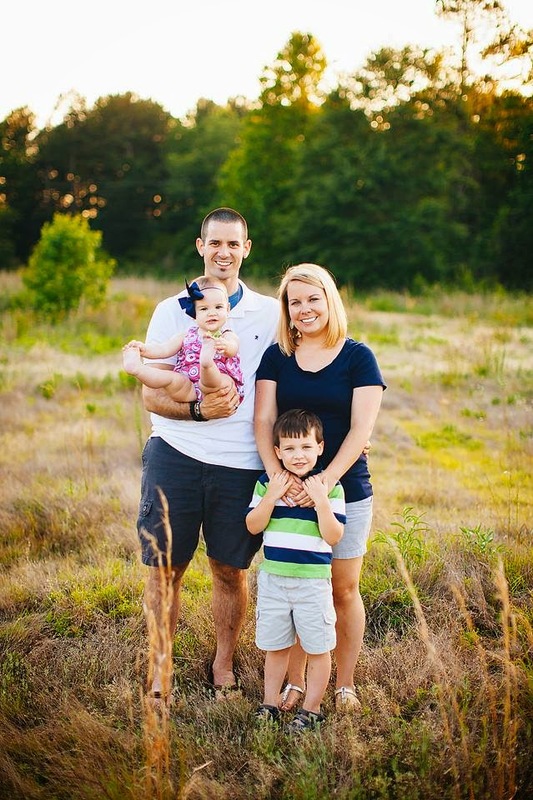 Luke became fully night potty trained a month after Emberly was born. Amazingly their cloth diaper journey never overlapped because she didn't use cloth diapers that first month! We received so many diapers as shower gifts that her little bum was covered that first month! Check back the rest of the week for what we do with wipes (cloth or disposable? ), when we have to troubleshoot (how do we wash? what to do with poop? diaper rash cream? stink? ), and the cost breakdown/savings. I do not cloth diaper to "save the earth" although that is a benefit. I cloth diaper because I have seen the difference with my own eyes of how they contain blowouts (we've never had one with cloth), and how gentle they are on their bums! We've never had diaper rash with cloth.